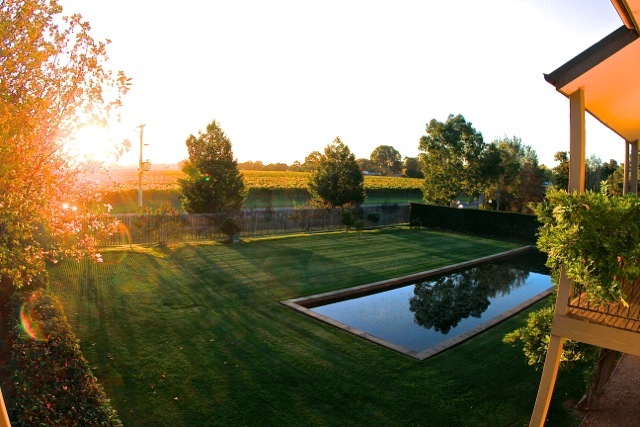 Home » Australia » A brief sojourn on Australia’s Prosecco Road, The King Valley, Victoria. 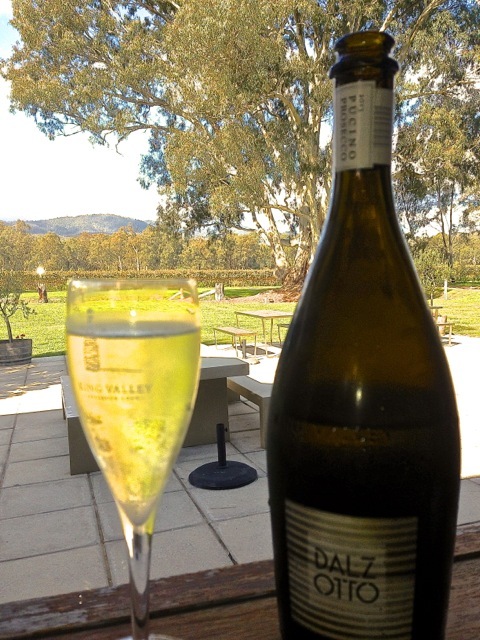 A brief sojourn on Australia’s Prosecco Road, The King Valley, Victoria. Vineyard view from Lindenwarrah, King Valley, Victoria. 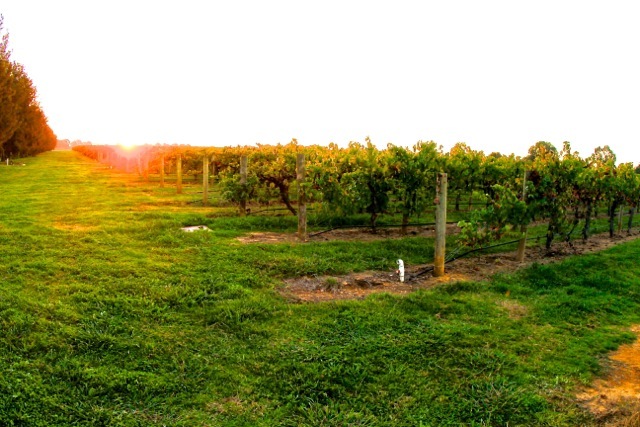 The King Valley in Victoria has become a wine region focussed on growing Italian grape varieties with some well known and respected wineries leading the way to give Australia’s its very own ‘Prosecco Road’. I love a good prosecco, and thanks to the experience with my good Italian friends Mel and Bucci on the Prosecco Trail in Italy, I was dying to see what the King Valley had to offer. 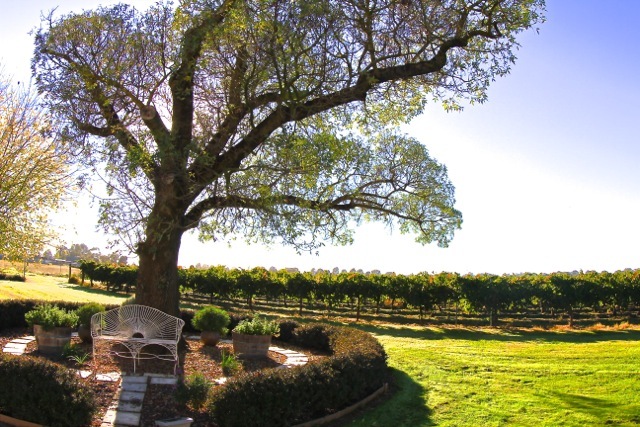 The King Valley is situated about 50 km’s from Wangaratta and just under 3 hours from Melbourne. 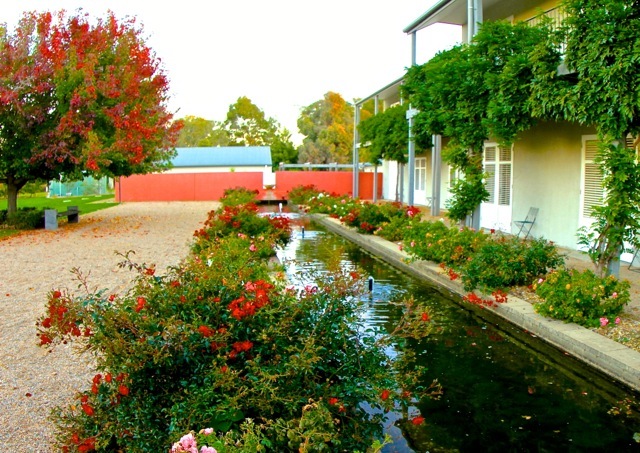 The area surrounding Milawa hosts many of the wineries, (sadly we had to leave some for our next visit! ), a wonderful cheese factory, Milawa Cheese, and the very lovely country accommodation, Lindenwarrah. View from Lindenwarrah Hotel, King Valley. Lindenwarrah is just a short walk away to the largest of the regions producers, Brown Brothers with its Epicurean Centre that hosts the fine dining restaurant Patricia’s Table.The region encompasses the small country town of Whitfield and it on the road to Whitford that we visited two wineries known for their prosecco, Australian prosecco pioneer Dal Zotto and Pizzini Wines. Dal Zotto, King Valley, Victoria. Dal Zotto and Pizzini are a 40 minute drive from Milawa and thankfully we arrived at Dal Zotto just in time for a quick lunch at their restaurant. We were warmly greeted as we entered the wine tasting room, but decided to leave the tasting for later, and instead tried their famed prosecco at the restaurant as an apertivo prior to lunch. It being midweek the restaurant offered a basic menu. An antipasto platter and a choice between one pizza or one pasta. We really wished we had visited on the weekend as the weekend menu on the wall offered several delights that had caught our eye. We will be back though! Apertivo at Dal Zotto, King Valley, Victoria. After a very nice lunch we went on to the tasting. Their best prosecco was our favourite, although we also enjoyed the pinot grigio and their easy drinking reds, sangiovese and barbara . We procured some for our cellar at reasonable cellar door prices. Still Life, Pizzini Wines, King Valley, Victoria. Then on to Pizzini. The greeting at Pizzini was a bit cold after Dal Zotto and the taster took quite some time to warm to us, and we didn’t fall in love with the prosecco quite so much. We did enjoy their reds though and added to our cellar again. It was closing time for the cellar door’s and time for us to make our way back to Lindenwarrah. View from Lindenwarrah Hotel, King Valley, Victoria. Lindenwarrah is gorgeous, with great grounds. It has a solar heated outdoor swimming pool, sauna, spa treatments on offer, a bar and restaurant. 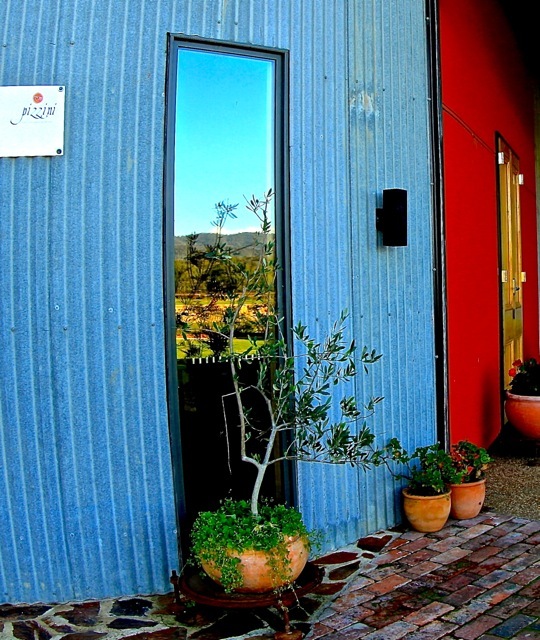 The hotel is surrounded by lovely gardens and overlooks vineyards. 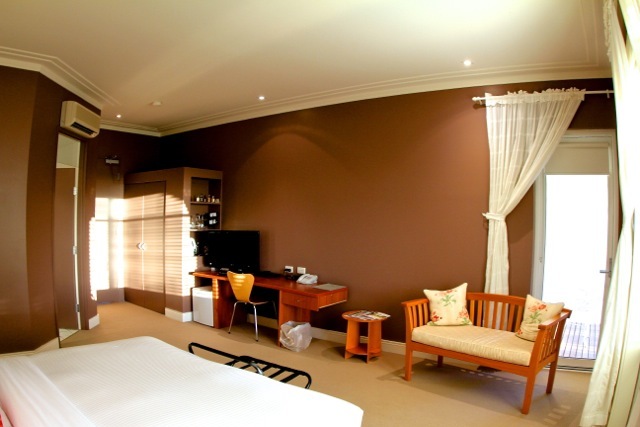 Our room was a large well proportioned sunset view room with a great outlook over the gardens and vines. It had a sweet furnished balcony to enjoy the view with a recently acquired Dal Zotto prosecco. Although the room was nicely furnished it was disappointing that the bed was two singles pushed together and hard. Housekeeping also had its hands full keeping the insects at bay as the room was full of mosquitos when we entered although spray was provided. We realised later sitting on the balcony that insects are a problem in this part of the country. Be prepared! 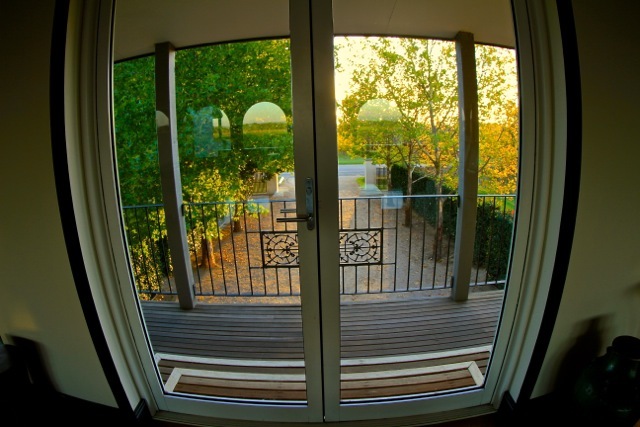 Sunset Room, Lindenwarrah Hotel, King Valley, Victoria. We had dinner at Lindenwarrah’s restaurant – Restaurant Merlot, with friends visiting from Wangaratta which was great fun. The atmosphere was enjoyable, the food was good but a bit up and down.The entree of cured ocean trout was lovely, and the beef good, while the chicken breast was dry. The side of a beetroot and feta salad was delicious. Entrees ranged from $22 to $25, the mains $33 to $37 and deserts $15 – $17. 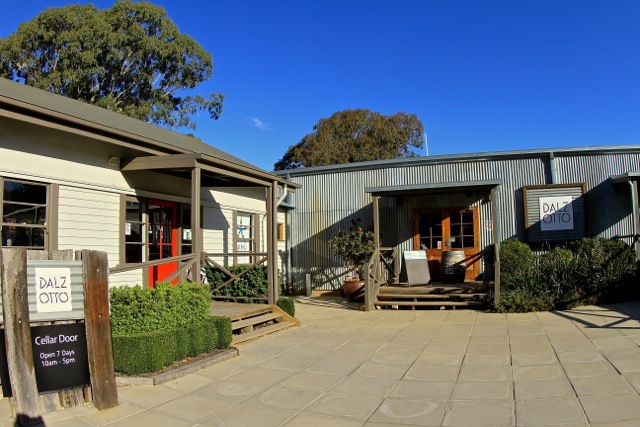 Restaurant Merlot, Lindenwarrah, King Valley, Victoria. Breakfast the next day was a buffet ($30pp) and while being fairly standard, it was nice. This was followed by a day of hard eating and drinking! Gardens Lindenwarrah Hotel, King Valley, Victoria. We started trying to get another coffee at the local takeaway in Milawa’s small group of shops. This didn’t go well as we were ignored. We did discover a local Italian restaurant that looked interesting so we booked for dinner. Coffeeless we then made our way to Milawa Cheese factory, where they were over run by customers vying for coffee, cheese and freshly baked bread. We hung in, and finally got our coffee and tasted some lovely local cheese. We loved the Milawa Gold, the Markwood, and the goats curd cheeses both hard and soft. Vines at Brown Brothers, King Valley, Victoria. Then we dropped the car back to Lindenwarrah and walked to our long, long lunch at Brown Brothers, Patricia’s Table. 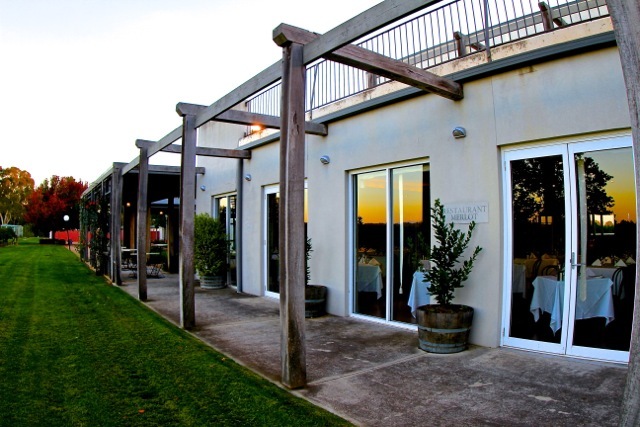 Brown Brothers have a large established Cellar Door, restaurant and wine bar in lovely grounds surrounded by vines. The fine dining restaurant, Patricia’s Table, specialises in showcasing Brown Brothers wines with the best produce available. It offers a selection of dishes with matching wines for set prices. We enjoyed a great lunch and all the wines matched well. It was a great experience and one I will look forward to having again. Truffle & Pecorino Tart, Patrica’s Table, King Valley, Victoria. The menu was so good it was hard to choose. 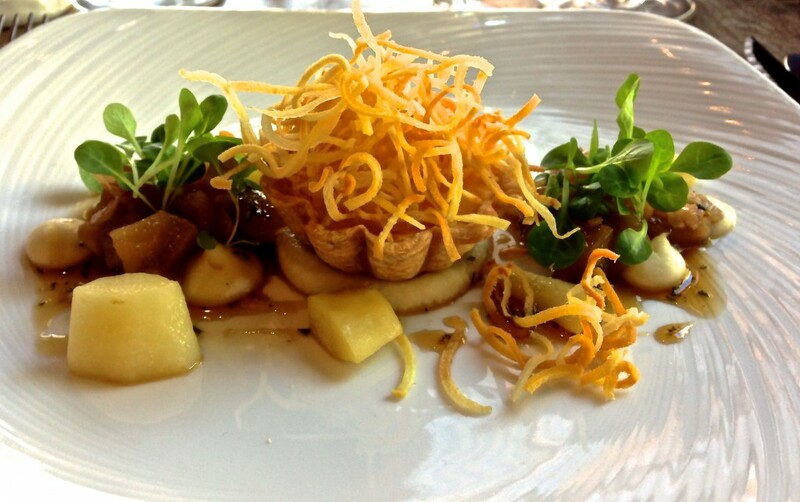 We decided on the parsnip and truffle percorino tart matched with a 2012 limited release vermentino. The beetroot and vodka cured ocean trout with cuttlefish & orange matched with 2012 limited release Banksdale Chardonnay. The mains we enjoyed were the lamb loin with almond peppers matched with 2012 Merlot and the beef fillet with a chimichurri & beef crespelie matched with the 2012 Tempranillo. 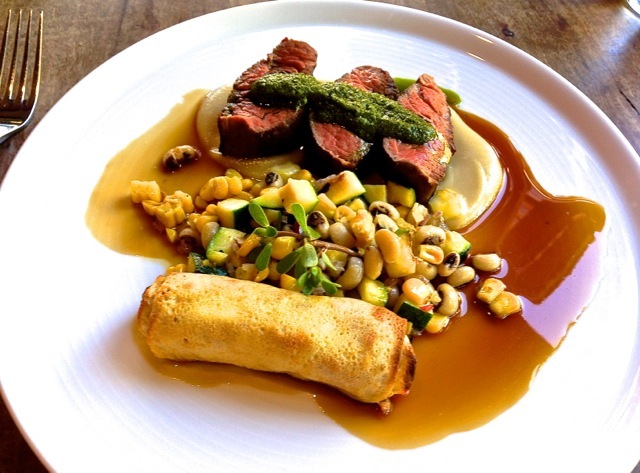 Beef fillet, Patricia’s Table, Brown Brothers, King Valley, Victoria. We ended our feast with a shared Blueberry Tart with a 2012 orange muscat. Heaven! A nap was needed after Patricias Table, but alas, no time. It was back to Lindenwarrah briefly and then on to dinner! Dinner was at a restaurant called Italy on a Plate. It had an Italian country restaurant atmosphere and the people were lovely. The Italian food was homely and enjoyable. It was like stepping into a local italian restaurant in a small northern Italian town with a square and clock tower just around the corner. They also had Italian wines to compare with the King Valley varietals. After much purusal we selected from the wine rack an absolutely lovely Vernaccia Di San Gimignano 2012 100% organic wine. Having been to San Gimignano and it holding a special place in our hearts this was the perfect way to end our King Valley sojourn. It didn’t disappoint and neither did the King Valley.